Friends and family know that I love books and I love studying. I strongly believe in life-long learning. Imagine my excitement when MOOC (in the form of Coursera) came to my attention last year. I like the idea behind MOOC – to bring education to the masses, allowing more people globally the opportunity to study university level courses. All the courses are free and in most cases (from what I have read so far) so are the learning materials. I started browsing through courses and found a broad range of subjects, from medical neuroscience, song writing, child nutrition cooking to artificial intelligence. 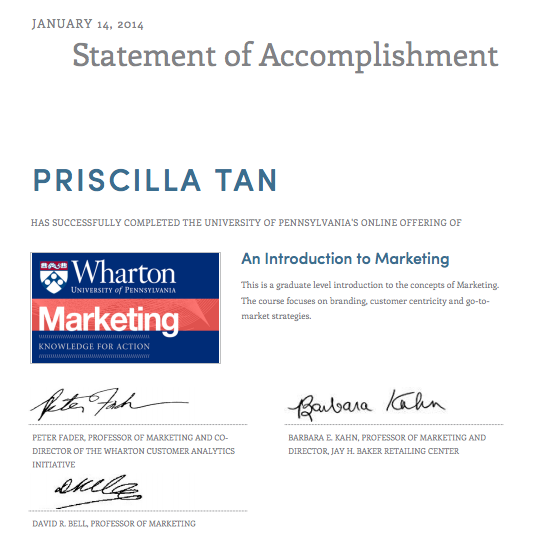 An Introduction to Marketing from the University of Pennsylvania was the course I eventually signed up for. It required some level of commitment to go through all the course materials each week and participating in forums, hangouts and completing the assignments. The returns, however were great! I gained new knowledge on Customer Centricity, new go-to-market strategies and social advertising concepts that I was not aware of. At the end of the course, I scored 91/100 for the exam and was awarded a statement of accomplishment signed by the three professors who led the course. Students can download and keep all the course materials even after the course has ended. I am currently enrolled in two other courses on Content Strategy from the Northwestern Uni and interesting one on Moralities of Everyday Life from Yale. While I am excitedly telling many friends about my experience with MOOC, only two have tried to do the courses. Most of the reasons are – “too busy” and “I am not very good at studying”. I would like to recommend Time Management for Dummies to the first group of people and for the latter, it is exactly what MOOC is about. It isn’t your traditional brick and mortar classroom studying as you know it. I have also read in news reports about low completion rate for those who enrolled. I am definitely not an expert in the education industry. I can’t tell if this will be a fad or it could be the future of education. BUT, I know that I’ve gained valuable insights and knowledge and I plan to continue learning. This entry was posted in Life Stories, Technology & Digital and tagged coursera, education, mooc, onlinelearning, onlinestudy, study by Priscilla Tan. Bookmark the permalink.